Always at the forefront of technology, Clearvision is dedicated to provide our patients with quality treatment experience and results through our modern LASIK equipment. We use the latest Schwind Amaris 1050RS for all our Safe Sight TransPRK procedures at Clearvision. The Schwind Amaris 1050RS is the fastest excimer laser in the market, treating 100 degrees of myopia in only 1.3 seconds. 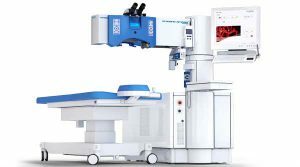 It is also the only laser with 7-dimensional eye tracking and zero latency tracking technology, which allows the most accurate treatment as it takes into consideration the tilt and roll of the eyeball. This translates into shorter treatment time during surgery, better accuracy, consistency and comfort for our patients. Clearvision’s LASIK Xtra is an additional treatment to the Safe Sight TransPRK procedure that helps to strengthen the cornea through corneal collagen cross-linking. It is a relatively fast procedure, taking an additional two minutes of time. Using the Avedro KXL system, LASIK Xtra can help to minimize the weakening effects that comes with the laser sculpting of the cornea in refractive surgeries. As laser sculpting with the excimer tissue involves tissue ablation, corneas will naturally become thinner after refractive surgeries. The higher your spectacle power, the more corneal tissue is required in laser sculpting. How does LASIK Xtra work? After the excimer laser has completed reshaping the cornea, Riboflavin (Vitamin B2) eye drops are applied to the surface of the cornea that has just been treated by the laser. After one minute, the Vitamin B2 eye drops will be washed off and the cornea will be illuminated with Ultraviolet A (UVA) light from the Avedro KXL system, which cross-links the collagen fibers within the cornea, making it stronger. The Zyoptix Diagnostic Workstation (ZDW) consists of the OrbScan and the Zywave Aberrometer. The Orbscan examines the structure, curvature and thickness or the cornea and its surrounding structures. By interpreting the OrbScan readings, our eye specialists can detect and diagnose eye conditions such as Keratoconus, Shallow Anterior Chamber Depths, Glaucoma, etc. The Zywave Aberrometer is used to measure Wavefront Errors, that include refractive errors such as myopia, hyperopia, astigmatism, as well as higher order wavefront errors that can be corrected using the Zyoptix Ultimate Procedure. The Topcon 3D-OCT uses spectral domain technology for the mapping of the retinal layers. This allows our eye specialists to look beyond what the naked eye can see. The 3D-OCT is especially useful in the detection and diagnosis of Age related Macular Degeneration, Macular Edema, Macular Holes, Epi-retinal membranes, and a lot of other retinal diseases. The 3D-OCT is also equipped with a retinal camera, that can capture an image of your retinal and correspond point to point with the scan image. The Oculus Pentacam is an advanced diagnostic device that employs the use of Scheimpflug images. The Pentacam is capable of scanning the front of the eye in less than 2 seconds. The Pentacam is highly accurate, due to its method of scanning, using the cornea centre as the pivot. The Pentacam can be used to help diagnose Narrow anterior chamber angles, Keratoconus, Cataracts, and other anterior segment diseases. The Digital Slit Lamp is also a very useful tool to help our patients understand the disease that is in his/her eye.